The Grand Central Stones in Van Cortlandt Park during renovation. Photo: Tatti Art Conservation. The Grand Central Stones in Van Cortlandt Park after renovation. Photo: Tatti Art Conservation. This summer a generous grant from the Paul and Klara Porzelt Foundation enabled the MAS to continue its legacy of involvement with Grand Central Terminal in a new and engaging way. Thirteen iconic ten-foot -tall stone pillars, “Grand Central Stones,” were placed in Van Cortlandt Park at the turn of the century to identify the most durable material for construction of the Terminal. Decades of graffiti, over- paint, and neglect had disfigured these monumental forms, obscuring their fascinating history. 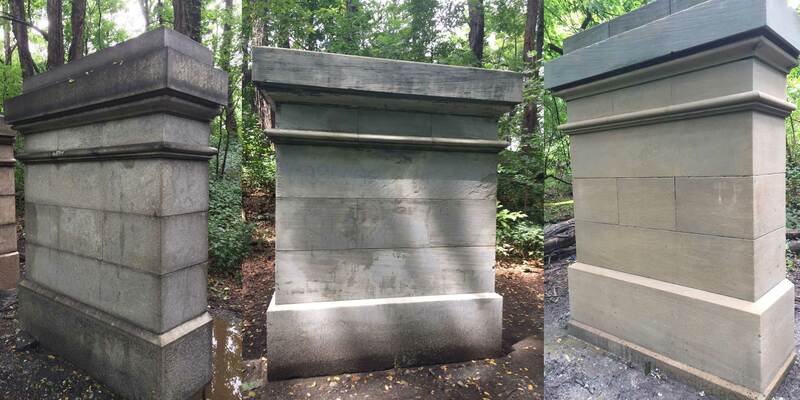 MAS partnered with Friends of Van Cortlandt Park to clean and conserve the stone pillars, returning them as closely as possible to their original dignity. Tatti Art Conservation executed the work. The MAS invited renowned historian Francis Morrone to research the provenance of the Stones. We are delighted to share Francis’s article, part of which will be incorporated in a NYC Parks historic sign placed near Grand Central Stones. Please take a trip to beautiful Van Cortlandt Park, walk the Putnam Trail, and discover this untold monumental treasure. 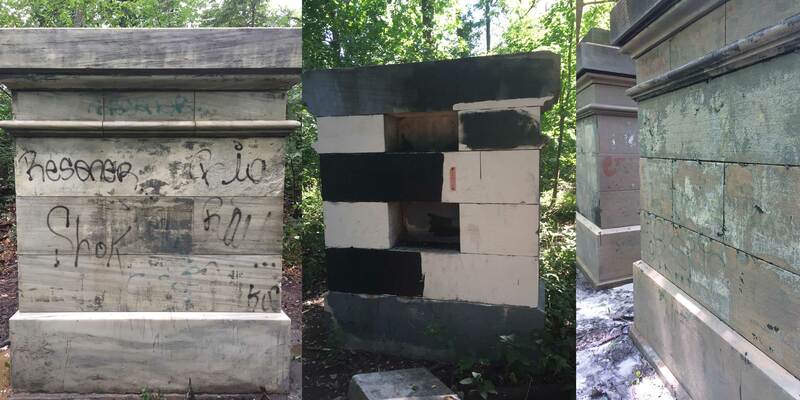 MAS is grateful to our great partners at Friends of Van Cortlandt Park, as well as the Porzelt Foundation for their ongoing support for Adopt-A-Monument and conservator Steve Tatti and his team for their expert restoration of this piece of New York City history. The Grand Central Stones in Van Cortlandt Park are a surprising and important part of the history of Grand Central Terminal, one of the nation’s most important buildings, and a lesson in the built history of New York City. In November 1905, the New York Central Railroad placed a series of stone samples in the open air on property the railroad controlled within Van Cortlandt Park. The purpose was to assess the effects of a New York winter on the samples of granite, limestone, and marble that the railroad and its architects, Reed & Stem and Warren & Wetmore, were considering for the exterior curtain wall of the head house of the new Grand Central Terminal, then under construction in midtown Manhattan. Grand Central Terminal was constructed between 1903 and 1913, with the station head house located between 42nd and 43rd Streets and Vanderbilt Avenue and Depew Place, astride Park Avenue. The structure is faced in two stones: Indiana limestone in the upper portion, and Stony Creek granite, from Connecticut, at the shopfront level. Construction of the head house began in 1910. (All construction up to then had been on the vast underground portion of the terminal, including the tracks and platforms and marshalling yards.) In 1905, when the stone samples were placed in Van Cortlandt Park, the railroad had not yet settled on many details of the head house design, including its curtain wall materials. Pennsylvania Station, on Manhattan’s West Side, was then under construction and being faced in a beautiful Milford pink granite from Massachusetts. That was one of the stones the New York Central Railroad considered for Grand Central Terminal, and a sample can be found here. Twelve samples of granite are listed, along with two varieties of Indiana limestone and one variety of marble (the Dorset that faces the New York Public Library). The granite selected was the Stony Creek, said in this list to have been provided by Norcross Brothers, while John Peirce is in fact credited as the contractor in charge of the terminal. Peirce, in fact, was an owner of the Stony Creek Red Granite Company. Some sources suggest the New York Central Railroad chose Indiana limestone for the greater part of its exterior curtain wall because it was the least expensive of the stones under consideration. It is true that the granites were more expensive. (Pennsylvania Railroad president Alexander Cassatt had indeed balked at the high cost of the granite, suggesting it be used only for trim, but his architect, Charles Follen McKim, insisted on its use.) But Indiana limestone was the most ubiquitous building stone of the City Beautiful era, and was much loved by New York architects and builders. In the following year the stone selections had been made and the John Peirce Company retained as contractor. Peirce, who held a financial interest not just in Stony Creek granite but in several Maine quarries, used the Fox Islands granite, from the coast of Maine, of which there is a sample here, for such prominent New York buildings as the United States Custom House, at Bowling Green, and the Hall of Records, on Chambers Street. The Indiana limestone selected for Grand Central Terminal appears to be the sample provided by the Perry, Matthews & Buskirk Quarry, the second stone from the left. The sample of Stony Creek granite selected for Grand Central Terminal appears to be the third stone from the right. Do note that today there are thirteen, not fifteen, samples on view in the park. It is possible that there were originally fifteen, and two have been lost, or that it was determined as unnecessary to have three samples of Milford pink granite; remove two of those three samples, and that leaves thirteen. Grand Central Terminal opened in February 1913. The stone samples remain in Van Cortlandt Park. Notably, the blocks of stone in the park are carved at their tops in two bands of fine mouldings, no doubt to assess the effects of exposure on fine carved detail. The Grand Central Stones were cleaned and restored by Tatti Art Conservation, through the Adopt-A-Monument program of the Municipal Art Society of New York in collaboration with Friends of Van Cortlandt Park, and was made possible by a generous grant from the Paul and Klara Porzelt Foundation, August 2017. Real Estate Record and Builders’ Guide, v. 76, no. 1953, August 19, 1905, 311. Real Estate Record and Builders’ Guide, v. 76, no. 1966, November 18, 1905, 773. Real Estate Record and Builders’ Guide, v. 77, no. 1990, May 5, 1906, 820. Sidney Horenstein, “Building Stones of the New York City Area,” in Geology and Engineering Geology of the New York Metropolitan Area (eds. C.A. Baskerville, N.K. Coch, S. Horenstein, M. Prinz, J.H. Puffer, G.R. Roberts-Dolgin and D. Weiss), American Geophysical Union, Washington, D.C., doi: 10.1029/FT361, pp. 4-6, 12.